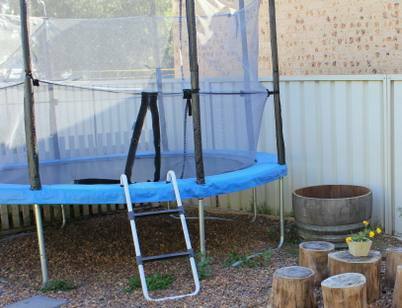 » Don’t Know What To Do With Space Under a Backyard Trampoline? Having a trampoline in your garden can make you a rock star with your children. However, you might have some doubt regarding the idea. It doesn’t matter if it is aesthetic or protection problems that make you worry. There are several ways to handle them if you landscape the area properly. You don’t need to transform the entire area. Just some easy changes may make you feel good about including a trampoline. 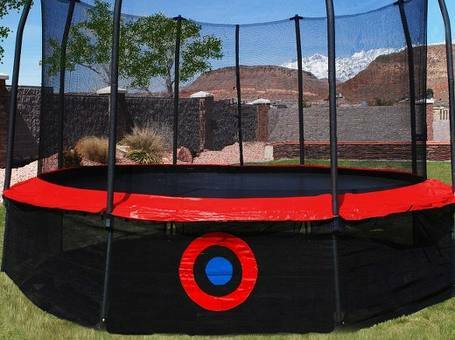 If you already have a trampoline in your backyard, here are some ideas including what to put under a trampoline. How Do You Grow The Plants? Can You Put a Trampoline On Gravel? The best way to make a trampoline look nice is to take care of the space under it. Keep reading for more details and our recommendations. After adding a trampoline to your backyard, you will need ideas of what to do with space under the trampoline. While not everything will be suitable to put on the trampoline, putting something under the trampoline would be an excellent idea and a lot better than having an unlikable weedy mess. The weeds can grow under a trampoline because it is shady and dry. Below are some ideas that will help you get what to put under a trampoline. Perhaps someone advised you to grow plants under a trampoline, and you are wondering if it is possible. Whatever you want to grow under a trampoline requires thoughtful consideration. You need to consider where the trampoline sits and if the plant you intend to grow will spread. Consider plants that do not grow high. Plants such as Astrantia, pulmonaria, odorata, and lamium can be a great choice. If the ground is too dry and shady and dry, try growing plants that you can go well with the condition such as ferns, but you will need to water them regularly. It can be hard to plant or weed or mow under a trampoline. This should not stress you as you can grow swan and sunflower plants in the region of the trampoline to create secret hiding, jumping and dreaming place for youngsters. On the base ensure you put down solid levels of newspaper topped with raw sawdust to create a preferred shady area for them. If the trampoline lets water go through it making the place to be watered, you may consider a biased shade grower like periwinkle. In case the trampoline does not allow water to go through it, the region may not support healthy plants as it will be too dry. Consider placing a solid level of organic mulch to make it tidy. Another thing to consider putting on a trampoline is a mat. Consider putting some mat under a trampoline, and in this case, artificial grass is a good solution. This will make the under trampoline garden appear more beautiful because even if you plant the natural grass, it might die if the area is dry. Artificial turf does not require maintenance as compared to the native grass. It is possible to put a trampoline on gravel, but you have to ensure that you put place a soft matting in the region of the access part to the trampoline. Ensure you have rubber feet to put beneath the legs of the trampoline. It will assist to sop up the collision energy. Advantage: You will not have to move the trampoline to maintain underground because it is gravel and doesn’t need any maintenance. Disadvantage: You risk getting injuries in case you slide and fall on the gravel. 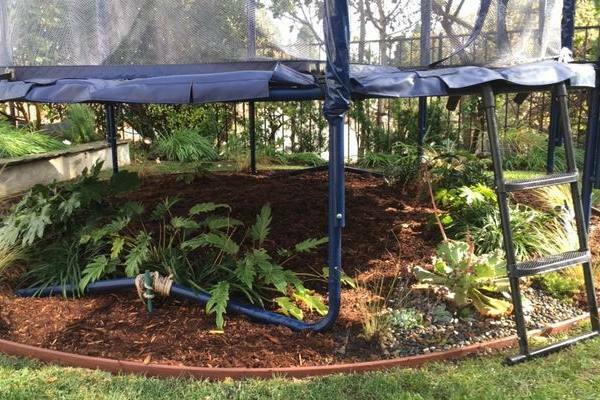 If you notice or there the plants under the trampoline are not healthy, you should take the necessary steps to protect them. You may use mulching but this only assists in moisture retention and not sunlight. One way to avoid mulching is by not placing your trampoline in a shaded area or with lots of trees. This will ensure that any plants you grow underneath the trampoline will not die due to lack of sunlight. 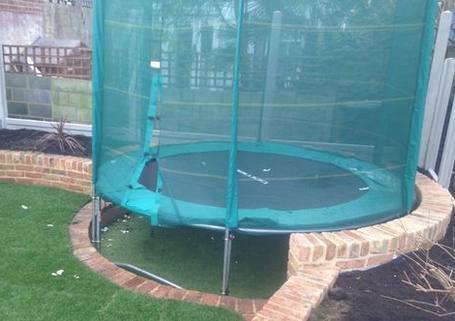 For many people, a trampoline kills the grass around the area. Some people also believe that it has a differing impact and that it grows the tallest in that region. If the grass around or in the area of the trampoline is dying, the best way to keep them alive is by moving within the yard. While this can be hard, it is a good option as the grass will be exposed to light when the trampoline is moved. 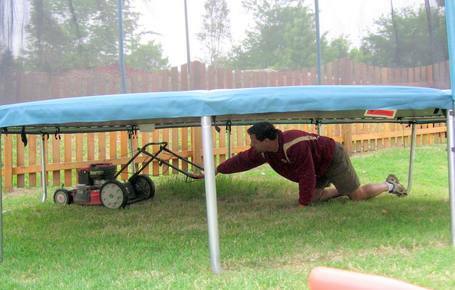 While it may seem had to mow under trampolines you can still do it successfully. If the trampoline is not movable, consider using a mower that has a folding handle. This could be easy as you can fold up and tie an extended grip stick to it. It is evident you want to utilize the space as much as you can. What if your trampoline is not in use, can you store something under it? Yes, you can. If you kids have bikes, this is the perfect place to store them. Sunken trampolines make a good shade as well. Several activities entertain, and you can do them in your backyard. You can add ornaments to your space and other types of equipment that may be beneficial to your kids. But a trampoline is great as you can all use it for fun. Apart from that, you can enjoy growing of different plants that can grow in dry areas. 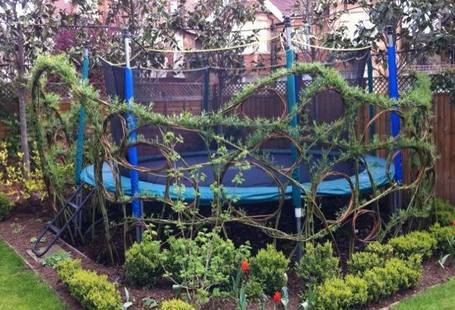 You can create a garden that can continue to exist even after you move the trampoline. If you are looking for what to put under a trampoline, consider adding artificial grass or planting ferns.